Almost exactly one year ago I did publish a post where I introduced 26 cracktros for the Commodore 64, 7 Cracktros for the PC and 4 Cracktros for the Commodore Amiga by one of my former release groups that is dear to my heard, Dynamic Technologies aka Dytec or simply DTC. I also created a remix video where I used the majority of Dytec logos that I had and many of the crack intro videos to show off some artistic high-lights of the group. 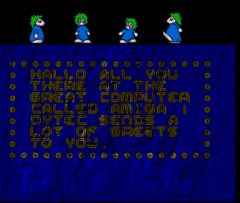 One thing that I noticed was that the few (4) intros that I had for the Commodore Amiga for Dytec, were pretty much all ugly and almost embarrassing. 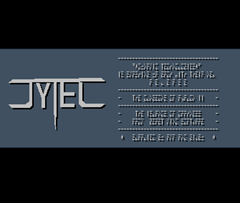 I was almost certain that there must have been more, since I do recall that we used logos for Dytec that were created on an Amiga for our Dytec PC cracktros. I always thought that those logos were used first in Amiga productions and were not created for the PC specifically (just like Dream Design did while he was in my art group SAC (Superior Art Creations) and also in Remedy Amiga (and “U.D.O.” hehe), still using his Amiga 500 as his main computer and only getting a PC much later). However, I could not find any of those, when I looked for them last year. 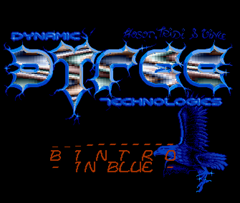 I temporary gave up hope, until recently, when I stumbled across new Dytec Amiga releases, which I have not seen before. They also look pretty good actually, nothing I would have to be ashamed of in any way. Well, I captured recordings for those and would like to expand on my original introduction and list of Dytec releases to provide a much more complete picture of the group. Why “unreleased”, since it was obviously made public? 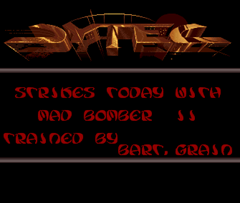 Well, it was never used for its original purpose … as cracktro/crack intro for the group, which runs before a computer game that was cracked and then released within the warez scene by Dytec. Not bad, eh?! Not bad indeed. An All-Time Dytec Member List?! While I was looking for the new Amiga productions and where I could download them, I started just for the fun of it, compiling something like a Dytec all-time member list. I did not take it as serious by far as the SAC All-Time Member List, where I spent a significant amount of time researching (and it is still not complete). What I want to say is that my list makes no claim to be complete nor 100% accurate. However, I think that it is better and more than anything that might be already out there. So here it is.. just for the fun of it. Update Note (02/2010): This list is not complete. I created a permanent page for Dytec, its intros, members and history on my web site, where the member list is updated. And while it is so nice to gather up all this kind of information and publish them here, I’d decided to throw in another goodie as a bonus (or something like that hehe). … from my Point of View, as I remember it! 1995 TRSI PC dissolves; several TRSI members join Genesis (formerly known as Pentagram). Assault becomes the Utility/Apps division of GNS, Dytec re-emerges as German games division; TDU-Jam is the English CD-Rip division (a German Games CD-Rip division also emerged, but I forgot the name of it). Genesis dies out naturally, since less and less games are being released on floppy disks anymore. Long distance calling across the Atlantic becomes a bigger issue, at the same time ISDN starts to dominate communication at least in Germany. All this causes a natural separation of the TDU-Jam and Dytec divisions, which eventually operate virtually entirely independent from each other. The friendship remained, but you could not speak of “one and unified” entity or group anymore. 1996 TRSI got revived, which is also rooted in Germany. Dytec became for a brief period of time what DRG and then Faith used to be, the German games release division of TRSI. (PC TRSI/DTC (Feb)) This period was only very short lived though and Dytec was once more on its own. Dupes became a major issue, due to the high phone costs that caused the shift of when most trading across boards in Germany occurred to the ungodly hours between 2:00 am and 5:00 am, when phone fees were at its lowest. The major players in the German games release scenes were shattered all over Germany, with Dytec in Berlin, Vortex in the Ruhr area around Essen; Backlash around Hannover and Empire of Darkness in the southern part of Germany. That two or more groups released the same game during the day or evening was not realized before 2:00 am when the cross country trading started. The leader of Vortex, Menion Leah contacted me to discuss the issue. We talked about each groups strengths and weaknesses. Vortex had slightly faster suppliers, but no good crackers. Dytec had some of the best in whole Germany. We teamed up for some trials, where Vortex supplied an original for Dytec to release and Dytec cracked a game for Vortex to release. Those tests worked very well and talks about a possible merger started. Then we thought about an even larger merger. Menion and Vortex had good contact with EOD, to whom Dytec had no contact at all. 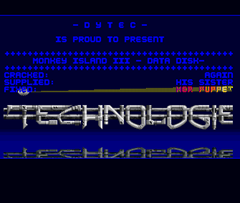 However, Dytec, specifically me and a long time board and sysop of a Dytec HQ had very good contact to Backlash. My Board was a Backlash site, even while it was Dytec PC WHQ and I knew several of the BLH guys personally and even partied with them (hard). A mega-merger was on the horizon: Backlash-Dytec-EOD-Vortex, but Backlash backed out, because they refused to merge together with the EOD folks for several reasons. The decision was made to move ahead with the merger, even with Backlash dropped out of it. Dynasty was born. The leaders of each founding group became the senior staff of the new found Dynasty. The WHQ problem was solved intelligently by not making any board to the WHQ, but the three former WHQ’s of the individual groups to HQ’s and former HQ’s to basic Distro. Sites. Backlash was the only serious competition for Dynasty. The relationship between the two rivals were mixed. While my BBS remained a Backlash site and I continued to consider several of the Backlash senior staff to be my friends, some ugly flaming occurred, especially between Backlash and former members of EOD on the Dynasty side.?? 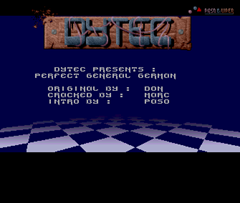 Dytec Amiga and C64 continued to exist. Dytec PC re-emerged (separated from Dynasty), initiated by The Driver & Shanon. I was retired from the Warez-Scene (I was busted in 1998), but disapproved of this separation/re-launch, but the original founder and highest instance in this matter, Fatman, who was by then also retired, gave his blessings. This revival attempt was short lived though. Why, I don’t know, because I was leaving Germany at that time and moved first to Switzerland (in 1999) and then to the United States in May 2000. Did I miss something important? Do you disagree with something that I said about how the events unfolded from my own personal perspective? I am human und thus biased and controlled by emotions. The human mind likes to play tricks on you when it comes to long term memories and remembering specifics from events that lie many years in the past. I did not do a gigantic amount of background checking and research, but I also did not just write everything straight out of my head as and how it came back to my mind. This said, feel free to leave your comments at the end of this blog post below. I won’t bite :). Email: NOT VALID AT THE MOMENT                      . . .:::::..  . WWW  : http://www.roysac.com/            .o$$$$$$$$$o. .:::::::::::. FTP: N/A                                    ` $$$  $$$`4$$$P? ?`4$$P"$$"
Some updates from my memories: The Amiga group started to be active in 1990 as we quickly formed a group of a talented bunch of guys after the fall of the Berlin wall in ’89, unifying a number of small Berlin groups (I personally came from the “Highlight Crew” and “Magic Duo”). In a way we were driving the East/West re-unification of the computer scene, our way. I remember it was quite a challenge to become a member too – we sort of had to make an application, showing off our artistic talent with music and graphics to impress the senior members in order to be approved. There was a lot of competition amongst the musicians, graphicians and coders, which was good. We had a lot of fun at our weekly gatherings, scene parties etc. I was a little desperate because due to the lack of good coders we never managed to create good demos to compete in the demo scene. DYTEC largely remained a de-centralized bunch of crackers and traders, though all members were very dedicated. But not too loyal – the business of joining other groups back and forth was a bit frustrating – we lacked direction. 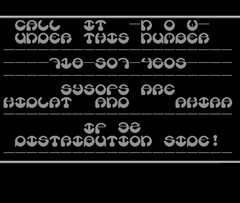 IMHO, Fatman (original founder) was central and could have made this group more of a legacy, like it was on the C64. Anyway, good memories and no regrets – DYTEC rulez! Let me know, if you see anything missing, members, intros etc. 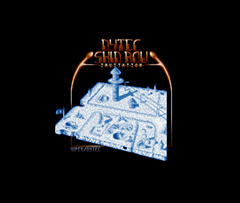 If you also have any original artwork (logos and intro gfx, also ASCII art, especially from the Amiga), used and not used, please send it to me. You can use the file drop-box at my contact page for that. Thanks and Cheers! Previous Post: Copyright Complaint Notice Filings in the Scene? WTF?